#1.1 12 Best Diversion Safes to Buy! #1.2.1 What are Diversion Safes Made of? #1.2.2 Do Diversion Safes Really Work? #1.2.3 What Can I Hide in a Diversion Safe? #1.2.4 How Much a Diversion Safe Costs? #1.2.5 What Diversion Safes Should I Avoid? #1.2.6 What are the Benefits of Having a Diversion Safe? #1.2.7 What are the Limitations of a Diversion Safe? #1.2.8 Should Only Diversion Safes be Used? The world of security has rapidly changed over the last couple of decades. Technology has become so innovative that there are safes that can actually inform you through your smart phone whenever someone is attempting to gain access into it. It is truly remarkable. Yet, the old-school ideas can sometimes be the best. There are many stories of people who stored their money inside their mattress or in a mason jar they buried in their backyard. These items worked, and this has been the innovation behind the diversion safe and stash container. These containers are made to look like ordinary household items, yet give you a space to be able to store your valuables. They are a great way to fool a potential thief, giving you additional peace of mind that your valuables are secure. Top 36 Best Diversion Safes That Will Keep Your Valuables Safe! Because this is such a great idea it is not surprising that there are many different options you could find for diversion safes out there. You want to find something that fits your needs and protect your valuables, so here are a list of a number of great options you can purchase. When you can hide something in plain sight, you are going to have a whole lot better chance to keep it from being taken, especially when the storage container is a common household item. That is why this air vent option is one of the best options you can find. You can fool almost anyone by attaching this item to the wall of your home. 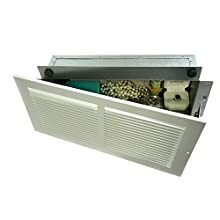 It will look like nothing more than a simple vent, and gives you access to your jewelry, cash, or other valuables by simply removing the cover. You will absolutely love the simplicity behind this, and you will also love that at 13.5 inches x 4.5 inches x 3.5 inches, there is a lot of room to store the things that matter to you most. A mirror is a common object found it almost any bedroom in the country. Many of these full-length mirrors are attached to a stylish frame that enables the person to be able to tilt the mirror at a specific angle to fit their needs. 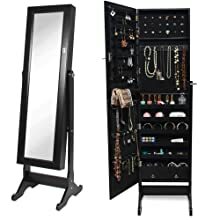 Since this is such a common object, what better way to fool others than to purchase a mirror that is actually a hidden cabinet. This cabinet is specifically designed to not only give you a great place to hide your valuables, but to also help you to keep them better organized. With a number of shelves, drawers, and clips, you can secure your rings, bracelets, earrings, necklaces, and other accessories. Plus, it comes with a lock to help you to feel more secure. A sweater bin could be the perfect place to hide your valuables, especially when it is designed with a false front to help you disguise that you are storing jewelry, money, or other valuable items. If that is what you are looking for, you are going to love this little stash safe. The bottom of this bin folds down, revealing a fabric panel that you simply pull out. You can attach your necklaces, bracelets, rings, and other valuable items to this panel, and simply push it back in to the bin when you are finished. The tray is 9.5 inches wide by 13.7 inches deep, by 1.3 inches tall, giving you plenty of room to be able to store the things that matter to you. 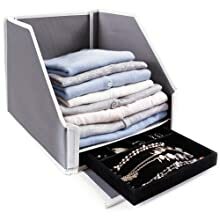 Plus, it works as a perfect location to store your sweaters, shirts, or pants. Maybe you just need a small storage container, something that is no larger than a pill bottle. That is where this D sized battery can become the perfect option for you to store money or other small valuables, like a ring. From the outside, this looks like nothing more than a simple battery. Easily mistaken for one, but the bottom on screws off allowing you to slide in a number of different kinds of valuables. 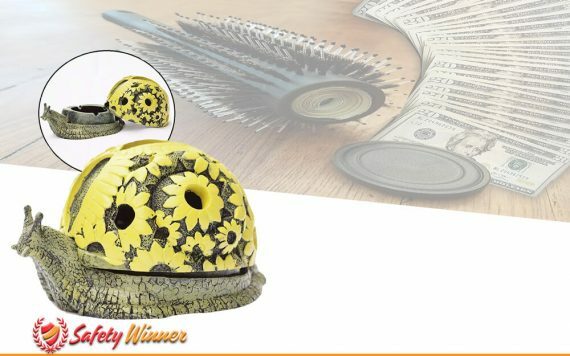 It is not only the perfect item for your home, as everybody has batteries laying around, but is perfect to take with you while you are traveling. Stick this in your suitcase or duffel bag and no one will think anything about it. If you are looking for a small container that works perfectly for hiding your valuables at home or while you are traveling, then an item you would take with you almost anywhere is what will give you the best amount of protection. 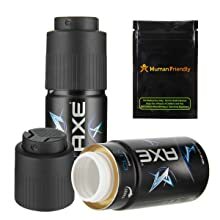 That is why you will love this Axe Deodorant diversion stash can. To most, this is nothing more than a simple can of deodorant. However, the top screws off to give you the perfect location to hide extra money while you travel or that you need to store your home. Plus, you will love that this product comes with a smell proof bag to keep your items free form moisture or unpleasant smells. The perfect addition to your gym bag as well. One of the more popular stash containers is to use this kind of nut and bolt diversion safe. It is perfect for you to be able to store money, pills, or other items that you need to keep hidden. 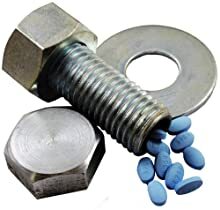 This nut and bolt, nation can easily slide into a spot where you are securing something using a bolt or you could hide it in a drawer in your garage or cabinet. This is one option that you will find to be ideal if you have things that you need to make sure that no one discovers. It can go almost anywhere, as its size is just 6 inches long, but it gives you a lot of bang for your buck. You can place this just about anywhere in fool just about anyone, plus it is easy to open and close, giving you the ideal access. Just about everybody has a container of bleach in their home. 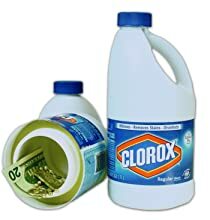 It’s one of the most common household products, but could also work to become the perfect location for you to store your valuable items.This is why you may find this Clorox stash container a perfect option. First off, most people would be fooled from the very start because the container actually holds Clorox. Thus, no one will believe that it is anything more than a bottle of bleach. However, the false bottom unscrews, allowing you to store money or other treasures you need to keep hidden. The space in the bottom is about a quart in size, plenty of room for whatever you need. Anything that would look rather ordinary can make for the perfect stash container, and this can of liquid wrench is a perfect option. 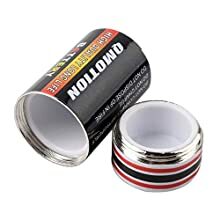 With the bottom that screws off and the general product inside the container, it would be incredibly difficult for anyone to have the slightest idea that you were hiding valuable items inside this can. Plus, this is a common product you could even have in your car, especially if you carry a toolbox with you. 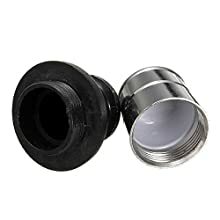 You could look like you were just on your way to your mother’s home to fix the plumbing problem but, instead, have valuable items secured inside the can. Items like money, jewelry, and even a switchblade or mace easily fit into here. Maybe all you are looking for is a small container to hide such things as medication. Then this could be the perfect solution for you. This car lighter shaped secret stash box is the perfect size to fit in your lighter socket in any car, making it virtually invisible to anyone and everyone. This is a unique ministorage container that is made of plastic and stainless steel, making it durable so that you get maximum longevity out of it. Included with the container is one pillbox, and the entire dimensions of the car lighter is 3.5 cm x 2.5 cm. This is exactly what you are looking for when you need to take a small amount of medication with you and you need to keep it secure. There are certain objects that virtually everyone takes with them. Chapstick is one such example. Whether you are a man or woman, it is likely that you take this lip balm with you. 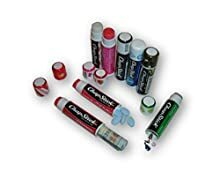 The truth is that most of us have to battle dry, chapped lips at some point, so we will carry Chapstick in our jacket pocket, purse, or simply have it in our car. This is why it makes for the perfect stash box. This container is 3” x 1.1” x 0.5”, and comes with a false bottom that you can remove to be able to store small objects, like pills or other similar sized items. It is the perfect choice for someone who needs a small space to store their item. The travel mug has become one of the most common items for people to have. 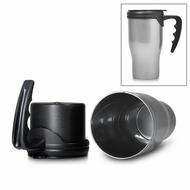 Most of us live a life that is on the go, so having a travel mug to keep your coffee hot or even your soda cold has become the perfect solution for the vast majority of people. Now you can combine this need with a desire to protect your items by purchasing a travel mug stash safe. This option allows you to screw off the plastic piece, revealing a small storage area for you to be able to store money, keys, or a wide variety of other items. Because people normally carry this item, you can easily leave it in your car are on your desk and no one would think anything about it. The micro SD card has become one of the primary means that people used to transfer data from one location to another. Maybe you are a person who has to bring information from your work to your home or to take with you while you travel and you don’t want anyone to have access to the information. This is where this stash container will come in handy. 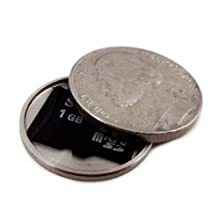 Now you have the perfect solution as this fake nickel opens up to allow you to store a SD card completely undetected by others. It is the perfect size for this type of microchip, and is ideal because you could simply take this nickel with you everywhere you go. Just don’t spend it. There may be questions you have related to a diversion safe. Here are some of the more common ones. #1 What are Diversion Safes Made of? That depends upon the kind of safe you were buying. Some are made of metal, but many of them are made of plastic. The reason behind this is that they are trying to blend in so that they look like an ordinary item. Metal is the perfect choice for a diversion safe that is to look like a can of hairspray, but that really wouldn’t work for a mayonnaise jar. #2 Do Diversion Safes Really Work? Of course they do. You can look up reviews of almost any one of these items and you will see positive comments by consumers. The truth is that the average thief is inside your home for no more than 15 minutes. They know where the places to find valuables are, so they don’t have a lot of time to be going through your kitchen cabinets were trying to figure out if an air vent is real or not. Misdirection and camouflage can hide your valuables from thieves. #3 What Can I Hide in a Diversion Safe? Truthfully you can hide anything that fits into it. Some of these safes are water resistant, adding additional protection for important documents. However, this is really about what you can fit inside there. #4 How Much a Diversion Safe Costs? Most diversion safes cost less than $30. Some you can find for as little as a few dollars. It is really about the kind of safe you are looking for. #5 What Diversion Safes Should I Avoid? Sadly, not all safes are built with the same quality. Some are extremely good at camouflaging your valuables, but after you have opened them a few times they fall apart. You will find reviews of some of these items to be negative, and those of the items to avoid. You want something that works and gives you the ability to gain access to your valuables when you need them. #6 What are the Benefits of Having a Diversion Safe? The benefits are obvious. The more likely it is for someone breaking into your home to ignore your valuables because they think that the container they are stored in does not contain anything valuable, the less likely your valuables are to be stolen. Protection of the things that matter to you are what these diversion safes are all about. #7 What are the Limitations of a Diversion Safe? The limitations are really around a few things. While they provide great camouflage, it doesn’t mean that a thief is not going to discover them. Some may have done their homework and know that people use fruit cans or hairspray cans to store their valuable items. These safes are also not fire resistant, and many of them are not water resistant. #8 Should Only Diversion Safes be Used? No. If you want to use a regular safe for your home then you should feel free to do so. A diversion safe is really about having a small location to be able to store valuable items. Most use this kind of safe as a level of protection while they travel. However, if you have a large number of items in your home that you want to keep secure, you may want to look into getting a standard type of safe.